sunrise and sunset time over the world, etc. Take a look at the image on the left. It is a visualisation of chances to qualify to the round of 16 out of group H. It resembles a dog, doesn’t it? 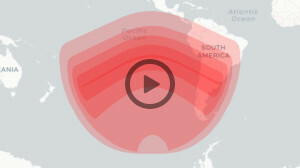 Is this an omen for Spain, Chile, Honduras or Switzerland? 😉 Good or bad? Who will win? Do any of today playing countries have a dog in their national emblems or any other signs? Is this Swiss Mountain Dog, maybe? And if so, is this good or bad omen for Switzerland? Will Switzerland win their match and mayby Honduras, Chile or Spain will qualify? We will see in a few hours. Anyway, good luck for them all. The below table shows situation in FIFA 2010 World Cup’s Group C before last matches of the group stage. 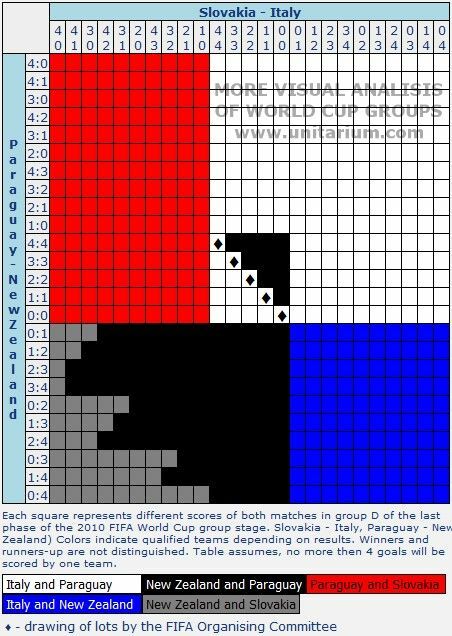 Each square on the drawing represents different result of last both matches in group C (Slovenia – England and Algeria – USA). Colors on the drawing show us who will go out the group and will be qualified to round of 16. 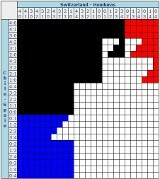 White and blue squares on the drawing tell us that USA will be qualified. As you can see, if the USA team wins against Algeria at least 1:0, it will be qualified to the next round (England vs Slovenia does not matter in this case). 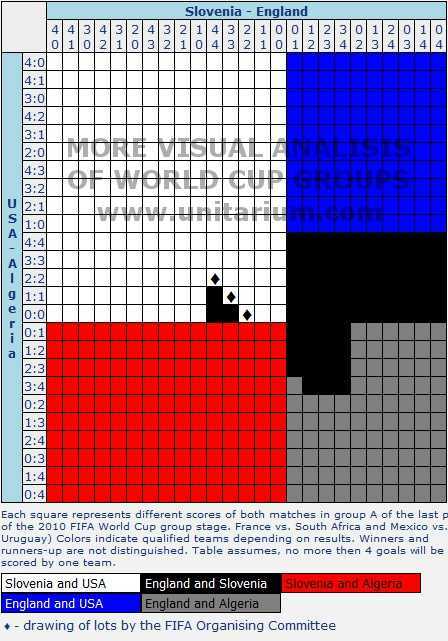 If USA draw to Algeria and England do not win to Slovakia, USA will be qualified in most cases, but there are some results that promotes England insted of USA (black squares in the middle). There are also three pairs of interesting results (USA – Algeria 2:2,1:1,0:0 and England – Slovenia 1:1,2:2,3:3) marked by the black diamonds. In this case both teams have same number of points (3), same number of goals (3,4 or 5 depending on the result) and same number of goals scored in match between USA and England. Due to the terms of FIFA World Cup, drawing of lots will be needed to find the winner. When does FIFA draw of lots to find the winner.